It's not uncommon for a bookshop to be a specialist in something. The obvious choice would be children's books – I've met six so far – but anything from Dr Who to radicalism has caught my eye, and they've all opened up a new world of reading. This week's bookshop is another such specialist, but instead of introducing me to another new subject it brought me back to familiar ground, because this week's bookshop specialises in 20th century classic literature, especially Penguin. I've previously mentioned the influence Penguin had on turning me into a lover of the classics, so as I'm sure you'll imagine, I was as enthusiastic as a kid in a candy store at the thought of visiting such a focussed destination. The bookshop in question is Books Iconica. Found in the indoor part of Camden Market, it's ideally placed to tease the cash-strapped as they join the never ending queue for the nearby ATMs. A location that must surely have prompted a sale or two. It's also near a place to sit and eat, which to me also means a place to sit, eat and read – it didn't take long before I dived into my purchase, but I'm getting ahead of myself. First we must return to me, loitering in a queue for a cash machine, being tempted by a bookshop not much bigger than a cubbyhole. The entire of the shop is certainly smaller than most, possibly the smallest I've been to, but the bold colours and carefully thought out layout mean it doesn't look small from the outside. Even when you step through the entrance (the shop front is open) and take the two (maybe three) further steps to the back, there's so much to see that size is definitely not to be complained about here. It also helps to remember this bookshop's priority is 20th century classical literature – it doesn't need as much space as other bookshops. On the day of my visit, the first thing I spotted was the half price table in the middle of the room, and it was from here that I was to select The Illustrated Man by Ray Bradbury as my purchase at the end of my visit, but first I looked around. The beauty of this bookshop was in the detail. I don't just mean the elegant visual stylings, but the detail of the books stocked. I'd have happily transferred the entire contents of Books Iconica to my personal bookshelves, from the varied standard fiction shelves to the collection of blue Pelicans, attractive hardback Penguins and even a well curated science fiction shelf. The bookseller who stocks these shelves has excellent taste. Luckily for them that person had the day off so they didn't get to suffer my enthusiastic praise in person. Not during this visit anyway. The thing is, I'm happy to recommend every bookshop I write about, they all have something special about them, but with Books Iconica the special thing is in the pretty much guaranteed happiness that awaits on the shelves. Because whether you're a long term classics fan or new to the genre, I reckon you could easily go and pick up any book from the limited but carefully selected stock and be happy. Which is good news for all those people standing in the queue for the ATM, because once they've collected their cash they'll have somewhere to spend it wisely. One of the things I've found that sometimes puts people off visiting bookshops is the fear of being out of place, of not knowing what to buy and of being judged for it. The simple answer to such fear is to tell them it's nonsense, but it's hardly a helpful answer: It doesn't help them to understand why their fear is wrong, it merely makes them feel even more uncomfortable because of your rather superior lack of support. Breaking the myth of such fear is one of the very many reasons I set up this blog, it's also why I repeatedly give examples of bookshops that take me out of my traditional comfort zone. This week's bookshop is another such example, only this time instead of visiting on my own (so I would be the only one to see my shame should the unthinkable happen and I got laughed out of the shop) I was on The London Bookshop Crawl with 30 or more other readers – several of whom (mostly female, there are no stereotypes in this week's destination) had visited the bookshop before and were absolutely within their comfort zone. Imagine the shame if, in front of all of them, me who's visited at least 150 bookshops in the last two years managed to metaphorically fall flat on their face. Okay, so I had the reassurance of experience and the resulting knowledge no bookseller worth their salt will ever laugh at a customer, but I was still a little nervous as I followed the crowd of bookshoppers heading into Orbital Comics. Yes, you did read the name correctly. 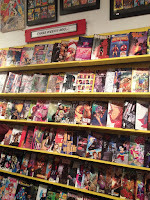 Orbital Comics is what can simply be described as comic and graphic novel heaven, and yes, that does make it a bookshop. A deceptively tiny shop front leads to a huge room stretching back what must be the space of at least four shops, meaning the stock is vast and the room large, bright and simply fascinating to look around when you spot all the comics lining the walls. 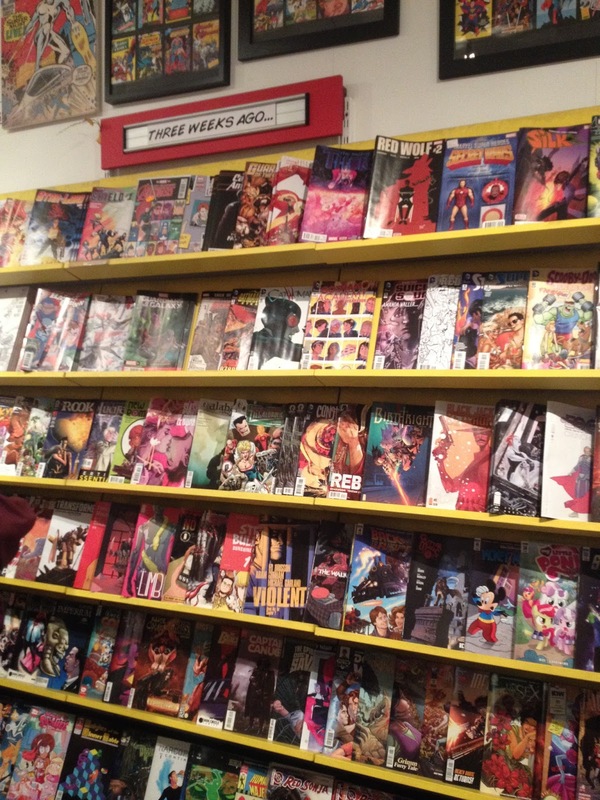 This is my first visit to a graphic novel shop so I found myself eagerly surveying my surroundings, from the bookcases of novels to the walls and tables of comics, including areas for comics published in the last week, two weeks, etc. This shop is as much a visual treat as it is a place to find something new to read. Recommends tables were filled with graphic novels to tempt me, but I'd done my homework and had a particular title I wanted to start with, Battle Royale. Typically, I hadn't done my research that well as in the excitement of the bookshop I couldn't remember the author's name: I went in search of a bookseller to help me out. They immediately took me to the right bookcase, where sod's law dictated someone had recently left a gap after buying the novel themself. A spin-off was available next to the gap but I like to start at the beginning. It was time to be honest. I admitted to the bookseller this was my first visit – would in fact be my first ever graphic novel purchase – and asked for his help. Unphased, he asked what I usually read and what I was after in a graphic novel and then said to give him a minute to look around. He soon returned with his first recommendation, Transmetropolitan, Back on the street by Warren Ellis and Darick Robertson. Ordinarily I'd be fussy and ask for a few options to choose from, but his synopsis grabbed my attention and made the sale. Orbital Comics is around the corner from Charing Cross Road and a mere hop, skip and a jump from Leicester Square, and now we've been introduced I'm sure it'll become a regular haunt among my London bookshop travels. Not only did the bookshop succeed in welcoming me and making me feel at home, it also introduced me to a new-to-me genre, and one I look forward to delving deeper into. Towards the end of last year I went to Paris. You know that because I've already told you about my reason for visiting: a bookshop. What I didn't tell you was that while I was there I also visited a bonus bookshop, the subject of this week's blog. I didn't mention it before because they're two very different bookshops and I didn't want them to get mixed up. It felt right to leave some space between the two visits and write-ups so that each would be appreciated individually: one for being a small, local bookshop with a community feel, the other for its international fame and the romance that somehow comes with it. Shakespeare and Company was opened by George Whitman in the 1950s, but as it's already a part of the literary tourist trail I see no need to give you a detailed history here. Instead I'll tell you about my first encounter with the bookshop, in the opening of one of my favourite films: Before Sunset. A film is perhaps an odd first reference to a bookshop, but that brief glimpse inside is all I knew of Shakespeare and Company for many years. Next I read a book. Written by a former tumbleweed, it gave me a glimpse of life in the time of George and created the image of a magical world. Finally, one bright autumn afternoon a friend and I left Notre Dame, crossed the Seine, wandered through a very small park and saw the sign of Shakespeare and Company peeking out. The bookshop itself is as pictured in countless images all over the internet. The accompanying antiquarian bookshop* is also there. Finally – and actually the first thing spotted on the route I took – is the accompanying relatively new cafe and a welcome opportunity to grab a cold drink and recover from a busy day exploring. Entering Shakespeare and Company is like walking into wonderland. A sign on the door asks visitors not to take photos and part of the bookshop's magic is definitely the journey of discovery as you explore the rabbit warren of rooms, meaning I'm reluctant to go into too much detail here but will say the nooks and crannies, writing cubby, random beds and countless other details are a joy to discover. There were also people everywhere. In one room a girl typed away at a laptop, while in another two friends chatted on a bed, and everywhere browsers comfortably jostled for space. It's always a joy to see a busy bookshop and every sight and sound served as an additional reminder of the bookshop's motto: Be not inhospitable to strangers lest they be angels in disguise. Its fame may mean Shakespeare and Company has transformed from the traditional community bookshop, but that in no way diminishes the achievement or experience. I happily browsed my way around the new books on the ground floor, enjoying booky conversations between fellow tourists and hoping the pleasure of this holiday visit will stay with them – and influence the locations of their bookshopping choices – when they return home. 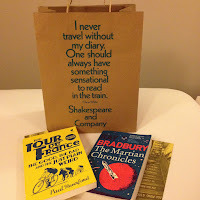 As for my shopping, my friend chose Paul Hansford's book about the Tour de France, while I picked up The Martian Chronicles by Ray Bradbury, and enjoyed claiming my stamp on the inside front page. 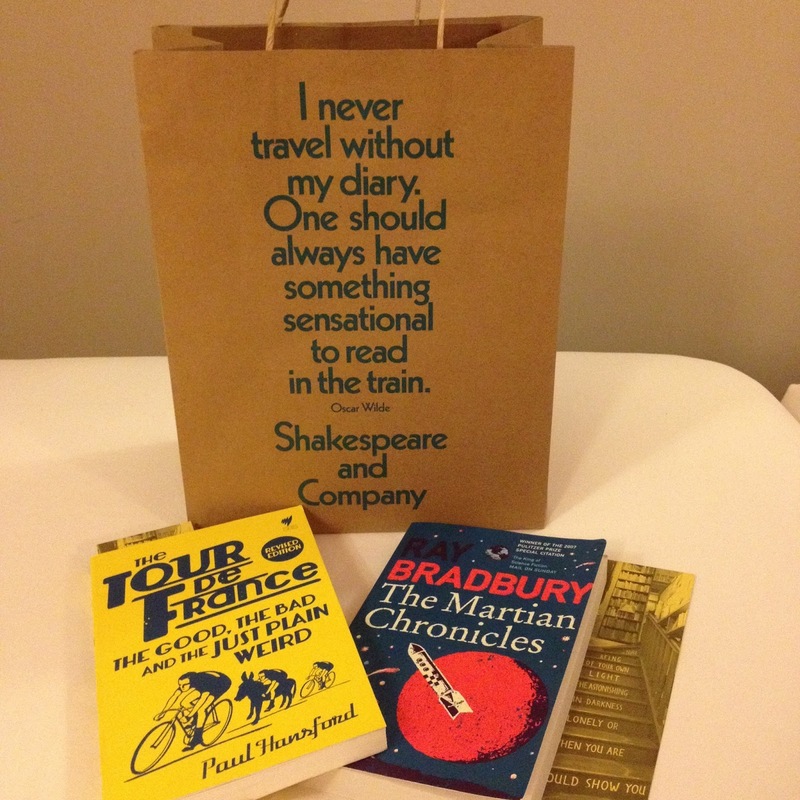 Books bought, it was time to return to the streets of Paris. As we walked away from the bookshop the gentle tunes of a pair of buskers gradually faded, easing us back into the bustle of the city. It may not quite have been a Julie Delpy/Ethan Hawke moment, but that didn't matter: this bookshop has a romance all of its own. * The antiquarian bookshop was closed at the time of my visit, I consider this an excellent excuse to return (not that I needed one).